Need a kid-friendly Lasagna recipe? Our Taco Lasagna recipe will not disappoint! 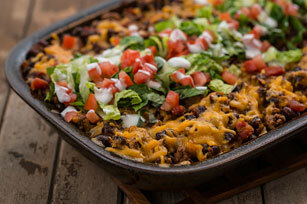 Kids of all ages will enjoy this Tex-Mex take on the classic. Brown meat with onions and garlic in large nonstick skillet. Add seasoning mix, salsa and water; mix well. Bring to boil. Stir in beans; simmer on medium-low heat 5 min., stirring occasionally. Remove from heat. Mix egg and cottage cheese until blended. Spread 1 cup meat sauce onto bottom of 13x9-inch baking dish sprayed with cooking spray; top with layers of 1/3 each of the noodles, cottage cheese mixture, remaining meat sauce and cheddar. Repeat layers twice; cover. Bake 55 min. or until heated through, uncovering for the last 10 min. Let stand 10 min. before cutting into pieces. Serve topped with remaining ingredients. For an extra kick of freshness and flavour, top with chopped fresh cilantro and finely chopped jalapeño peppers just before serving. Serve with a crisp green salad tossed with Kraft Italian Zesty Lime Dressing.